Welcome to the new Feature Friday! That's right. Starting now, I will feature another blogger on my website EVERY friday. 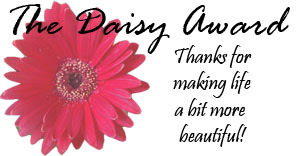 But this award (The Daisy Award!) is not just given away to ANY blogger. "This award is given to fabulous vegan bloggers who make their readers smile with personal stories, delicious recipes, and fabulous tips. You appreciate the beauty in life while in the moment, and that’s an important part of living! Compassion comes from the inside out; as a vegan blogger, your compassion shines through your heart and is apparent in the words and memories you share everyday with your readers. You change the world, and for that, you’re truly a daisy: something that captivates and brightens people’s day. Congratulations!" The above is what I will be sending in an email to each person I choose to feature, along with a list of questions for them to answer on their blog. They will also be asked to link to 5 other bloggers who make them smile. Sound good? For my first Feature Friday EVER, I've chosen Chef Katelyn! Wowza. Can I just say, this girl INSPIRES me on a daily basis. Katelyn is a runner, health food enthusiast, recent high school graduate, and fabulously down to earth girl who makes me smile. Well, she writes like she speaks (or at least, that's what it seems like to me!). Her vocabulary cracks me up, and she calls her readers her "bloggy boos," as well as makes up other random words to describe things. She also stays away from sugar, so for those of you who love sweets but hate sugar, check this girl out! Her recipes use Stevia (a natural, plant-based sweetener) and seem sinfully delicious. I would love to make her Sinless Chocolate Fudge Cake sometime! She also really shares herself through her blogging. She shares memories, stories, and heartfelt thoughts to her readers on a daily basis, which I think is great. As you all know, I have a passion for seeing the beauty in life and remembering all the great times I've had. It's all about being compassionate, making people smile, and loving the life you life. Katelyn totally does that! So, head on over to Chef Katelyn right now and check her out! Post your thoughts below and let me know what you think, or if you have any nominations! no problem girlie! :) love the site!